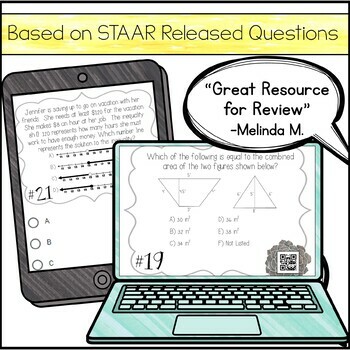 This test review activity is a set of 24 Task Cards (with & without QR codes) to help prepare for the 6th Grade STAAR Math Test. All TEKS are covered in this set of test prep task cards. 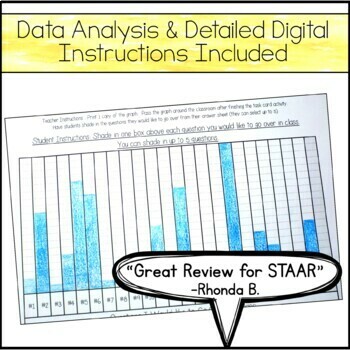 Also included is a post-activity data analysis sheet so this activity can be used as a Summative Assessment to analyze which TEKS need to be reviewed further or retaught. •	Task Card Set #2 is my newest set that adds questions from the 2016/2017 6th grade math STAAR test. 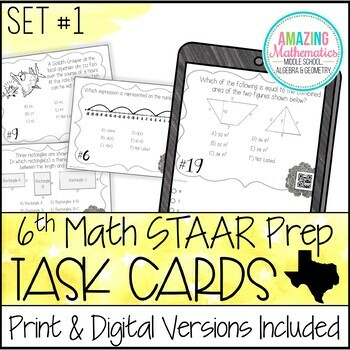 •	These task cards are designed specifically to meet the preparation needs for the Texas STAAR Test. All 6th Grade TEKS are covered. If you do not teach in Texas this may not be suited for your classroom. •	These are aligned to the new TEKS that were implemented in 2014/2015. •	All questions are state assessment level questions, which makes this a fun and engaging test review activity. •	Please view the preview to help decide if this product is right for your classroom. •	Student response sheet and answer key included.